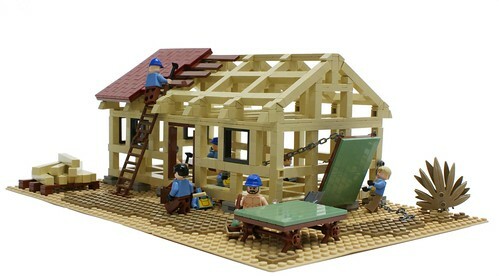 Brick Town Talk: Grab a 2x4 - LEGO Town, Architecture, Building Tips, Inspiration Ideas, and more! Out West, United States - (BTT) More people are flocking to Matija Grguric's town, and that calls for some more buildings! And with more buildings, comes the demand for more lumber! The owner of the local rail line has expressed great joy in the development of this new town. When asked about other shipments to the town, the owner replied, "Hats. Lots of hats and wigs. Everybody's bald around here, I don't get it."